This is a free event and seating is limited! Inspired and led by the Honorable Minister Louis Farrakhan, more than a million Black men gathered in Washington, D.C. to declare their right to justice to atone for their failure as men and to accept responsibility as the family head. During Min. 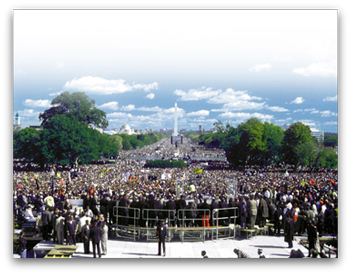 Farrakhan’s message to the millions gathered in the mall and those watching on television around the world that day, he explained to the world the need for atonement and he laid out the eight steps of atonement. Thus, for the past 18 years, people gather, reflect and observe the Holy Day of Atonement. “The March changed my life and my perspective of life in so many ways. I (gained) a tremendous commitment to the betterment of my culture, and a heightened capacity to care and to love. I am now trying to live by the code of honor and the right conditions set forth in the pledge that I took,” said Glenn Towery, owner of Fairy God Brother Productions and Film Company, LLC that produced the DVD, Long Live the Spirit, a documentary about the Million Man March. In another public display of accountability, the Million Man March was the first ever public march to provide an independent Financial Audit of its operations. I PLEDGE that from this day forward I will strive to love my brother as I love myself. I, from this day forward, will strive to improve myself spiritually, morally, mentally, socially, politically and economically for the benefit of myself, my family and my people. I PLEDGE that I will strive to build businesses, build houses, build hospitals, build factories and enter into international trade for the good of myself, my family and my people. I PLEDGE that from this day forward I will never raise my hand with a knife or a gun to beat, cut, or shoot any member of my family or any human being except in self-defense. I WILL NEVER again use the ‘B word' to describe any female. But particularly my own Black sister. I PLEDGE from this day forward that I will not poison my body with drugs or that which is destructive to my health and my well-being. I PLEDGE from this day forward I will support Black newspapers, Black radio, Black television. I will support Black artists who clean up their acts to show respect for themselves and respect for their people and respect for the ears of the human family.